This week’s pick is Fan Duel: One Day Fantasy Sports Leagues. This is of course the official iPad (and iOS) app for the hugely popular Fan Duel daily fantasy sports site. FanDuel brings you one-day fantasy sports leagues for real money. Winners get immediate cash payouts. No season-long commitment. Join public leagues or play with friends. Over $10 million paid out every week! Entry fees start from $1. Featured on ESPN, Sports Illustrated, The New York Times, The Wall Street Journal, and Yahoo! Sports. Unlike traditional fantasy leagues that run for the entire season, FanDuel leagues last for just one day or one week, so you’ll get to pick new teams on a weekly or daily basis. 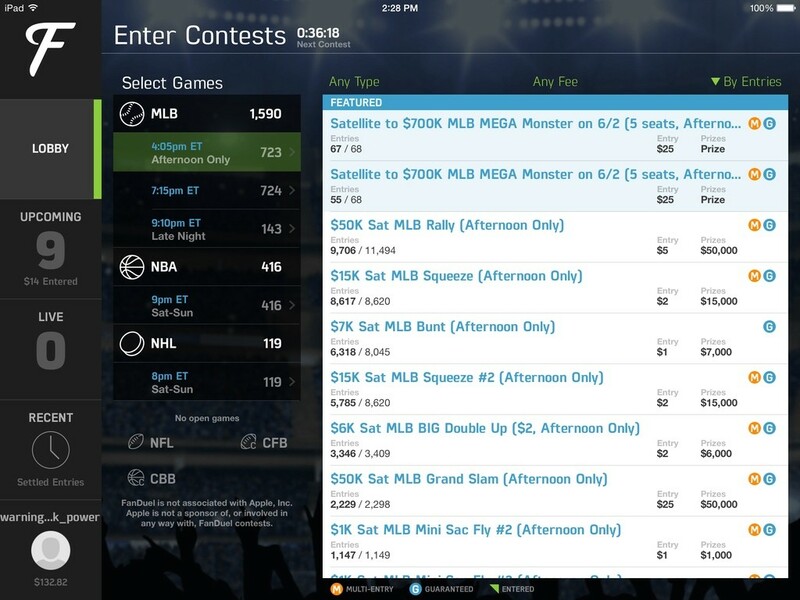 I recently discovered daily fantasy sports and I’m now a big fan of the concept. It strikes me as much more fun than typical season-long fantasy leagues. And potentially even a way to make a little extra pocket money if you can figure out a way to win consistently (which is no small challenge, of course). I’m learning the ropes with daily fantasy for the MLB,, and if I keep enjoying it I’ll probably have a crack at NBA next season. The two sites I use daily are Fan Duel and DraftKings, and I’m glad to see they both have stellar iPad apps. The Fan Duel iPad app has a clean and simple to navigate UI. 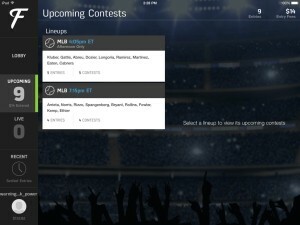 In the Lobby section you can check out available contests for MLB, NBA, and NHL , and create and submit lineups. The Upcoming section shows future contests that you have entries in. You can review and edit your lineup in this section. 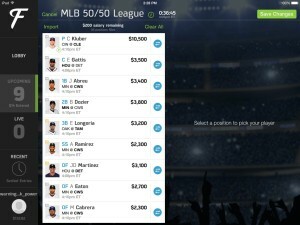 The Live section is the one I spend the most time in – as it lets you keep up with how your lineup / lineups are doing in every contest you’ve entered that’s underway. In the Recent section you can look back and review not only your own past lineups, but any of those used by people you competed against in past contests – which is hugely useful for assessing your own strategies and those of the folks who are beating you. Finally, there’s an Account section – where you can see your current bankroll, add or withdraw funds, and review Rules and How to Play material. Basically, this is a pretty comprehensive iPad app, that lets you do a lot of what you can do at the Fan Duel site itself. If you’re a fan of daily fantasy sports, or curious to give it a go, you’ll want to take a look at this app. Here’s an App Store link for Fan Duel for iPad; it’s a free app designed to run on both iPad and iPhone. *** You must be at least 17 years old to download the app. If you end up wanting to sign up for Fan Duel, it would be lovely if you use my referral link for the site. And of course you can look out for me for head-to-heads and so on; my username is Warning_Track_Power.